Elon Musk just announced via a Twitter post that the Tesla solar roof panel can be pre-ordered starting from May 10, 2017. The billionaire said that the roof can be ordered in any country on the globe. Tesla’s founder also said that roof tiles have an “Infinity Warranty”. According to Musk, solar glass tiles are so durable that they will have the a lifespan that should exceed the lifespan of any house (and they seem pretty sure about this). Although this lifetime warranty seems absurd, the tests showed that Tesla’s solar roof panel is resistant to blows produced at a speed of 177 kilometers per hour. 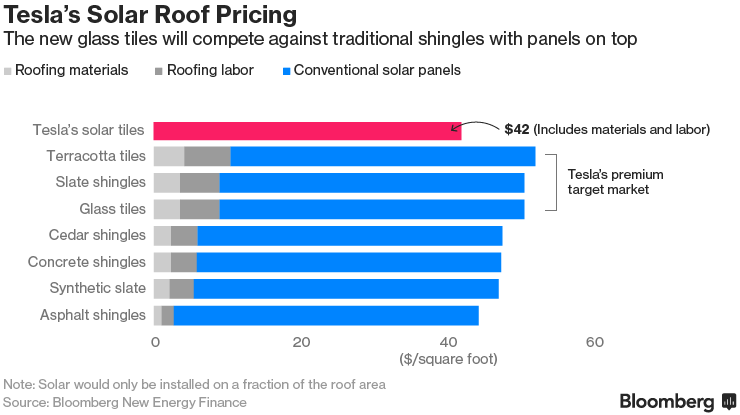 Musk also notes that Tesla’s solar roofs are much cheaper than traditional ones. The company’s website also presents other solutions that could be used along with the solar roof, which could lower the energy bills in any home. As explained on the company’s website, “With an integrated Powerwall battery, energy collected during the day is stored and made available any time, effectively turning your home into a personal utility”. The first two styles that are programmed to be released will be priced at about $21.85 per square foot. Bloomberg noted that the total price (including additional materials and labor) should reach around $42 per square foot, which is cheaper than its competitors. A recent study concluded that the North Pole is warming up at an unprecedented rhythm!